First things first: Do you, as half of the ChefsFeed team did, call it SHER-BERT? Well, a few fancier people said SHER-BAY. Guess what, folks? There is no 'r' in sherbet! We've been living a lie! The closest thing to an expert opinion we got came courtesy of ice cream queen Dana Cree (executive pastry chef of The Publican restaurants in Chicago), who told us her dairy science professors at Penn State were adamant: It’s pronounced “Sure Bit." Sherbet, she added, has very few restrictions and definitions compared to ice cream, ("Legally, it must contain butterfat, but just a little, no more than 4% and no less than 2%,") and while we associate it mainly with fruit flavors, it seems to have lost favor of late, to things like sorbet and gelato. Perhaps this will be the summer we reclaim the form; you may not have realized it, but sherbet is the perfect format for all that fruit flooding your local markets. "Sherbet is the best way to express fruit flavor in ice cream," she explains. "With just a touch of creaminess, the fruit flavors truly shine! Buttermilk can stand in for some of the milk, which blesses the sweet ice cream with much-appreciated acidity. I consider sherbet to be half way between sorbet and ice cream: the creamiest sorbet you’ve ever had, or the fruitiest ice cream." "I'm doing what I can to start a sherbet renaissance," she adds. If you're ambitious, try your hand at Cree's recipe from her new book HELLO, MY NAME IS ICE CREAM: THE ART AND SCIENCE OF THE SCOOP, or just rummage deep in the freezer section of the corner store for a nostalgic Push Pop or two. Long live sher-bert. At Poppy restaurant, Jerry Traunfeld taught me to work with anise hyssop, a tall purple-blossomed plant that grew in our garden. The leaves are soft like the fuzz on a newborn puppy, and the flavor is the most inviting form of anise I’ve ever tasted. Anise hyssop lacks the sharp angles of licorice, the twang of star anise pods, or the bright edge of fennel, and the leaves can be eaten fresh like basil, or steeped into panna cotta, whipped cream, and ice cream. I spent each summer at Poppy harvesting these leaves, all the while looking for new and exciting fruits to pair with them. I didn’t have to look far. Anise hyssop works with just about everything. Raspberries will forever remain my favorite pairing for it though, and this sherbet captures their flavors perfectly. When I don’t have access to anise hyssop leaves, I use green anise seed. Replace the anise hyssop with 5g | 1 tablespoon of the anise seeds and infuse them in the cream in the same manner as the leaves. You won’t be disappointed! If you want a plain raspberry sherbet, omit the anise hyssop or seed from this recipe, and you’ll find the pink scoops you’re looking for! 1 Best texture: Commercial stabilizer 3g | 1 teaspoon mixed with the sugar before it is added to the dairy. 2 Least icy: Guar or xanthan gum 1g | 1/4 teaspoon whirled in a blender with the sherbet base after it is chilled in the ice bath. 3 Easiest to use: Tapioca starch 5g | 2 teaspoons mixed with 20g | 2 tablespoons of cold water, whisked into the dairy after it is finished cooking. 4 Most accessible: Cornstarch 10g | 1 tablespoon plus 1 teaspoon, mixed with 20g | 2 tablespoons of cold water, whisked into the simmering dairy, then cooked for 1 minute. Make the raspberry mixture. Whisk together the raspberry puree, buttermilk, and malic acid in a small bowl. Set in the refrigerator. Boil the dairy. Place the milk, cream, sugar, and glucose in a medium heavy-bottomed saucepan over medium-high heat. Cook, whisking occasionally to discourage the milk from scorching. When the dairy comes to a full rolling boil, reduce the heat to a low simmer for 2 minutes. Remove the pot from heat. Infuse. Stir the anise hyssop into the dairy, and allow to infuse for 30 minutes. Strain and chill. Strain the infused sherbet base through a fine-mesh sieve, into a shallow metal or glass bowl, discarding the leaves. Fill a large bowl two-thirds of the way with a lot of ice and a little water. Nest the hot bowl into this ice bath, stirring occasionally until it cools down. Mix the sherbet base with the raspberry mixture. When the sherbet base is cool to the touch (50°F or below), remove the bowl from the ice bath 2. Add the raspberry mixture to the base, whisking until evenly combined. Churn. When you are ready to churn your sherbet, place it into the bowl of an ice cream maker and churn according to the manufacturer’s instructions. 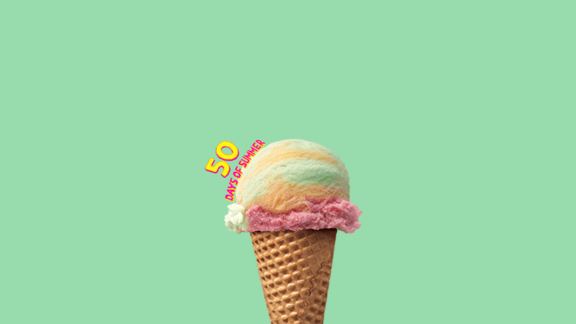 The sherbet is finished churning when it thickens into the texture of soft-serve ice cream and holds its shape, typically 20 to 30 minutes. Harden. To freeze your sherbet in the American hard-pack style, immediately transfer your finished sherbet to a container with an airtight lid. Press plastic wrap on the surface of the sherbet to prevent ice crystals from forming, cover, and store it in your freezer until it hardens completely, between 4 and 12 hours. Or, feel free to enjoy your sherbet immediately; the texture will be similar to soft-serve.